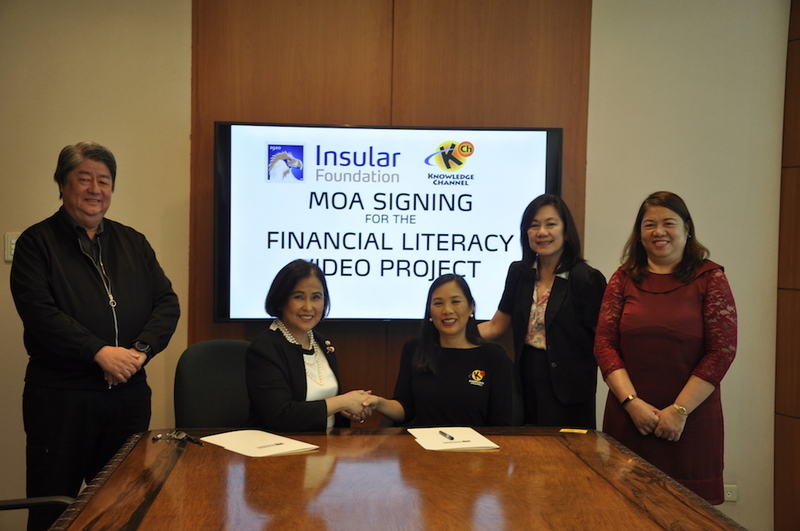 Insular Foundation, Inc. carries on with its advocacy of raising the quality of education in the country as it renews its partnership with the Knowledge Channel Foundation through the signing of the Memorandum of Agreement for the Financial Literacy Video Project for Grade 9 students. Insular Foundation Chairman and President and Insular Life Chief Executive Officer, Ms. Nina D. Aguas and Knowledge Channel Foundation, Inc. President and Executive Director, Ms. Rina Lopez-Bautista led the signing of the agreement. Witnessing the signing are Insular Foundation Vice-Chairman and Insular Life Chief Operating Officer, Ms. Mona Lisa B. Dela Cruz, Insular Foundation Trustee and Insular Life Executive Vice President Mr. Jesus Alfonso G. Hofilena and Insular Foundation Administrator and Insular Life Senior Assistant Vice President Ms. Ana Maria R. Soriano. The one million-peso project will fund two 20-minute Estudyantipid video episodes for Grade 9 Araling Panlipunan - Economics, with topics on Consumption, How to be a wise saver and the Importance of savings and investment to help improve the economy. These episodes will be the sequels to the first Estudyantipid launched in September 2016. Estudyantipid I gained positive feedback from the students because they found the characters in the video relatable as it depicts real-life situations suited to the age of the viewers. The videos also come with e-learning modules and session guides to assist teachers in discussing the subject. Ms. Nina Aguas said that producing financial literacy videos is not only aligned with the Insular Foundation’s thrust to create educational programs targeted to the secondary and tertiary level of education, but is also consistent with Insular Life’s advocacy of educating the populace on savings consciousness and financial literacy. And it should start this early in schools. The educational materials are expected to reach more than 4,000 Grade 9 pupils in 3,300 public high schools. The general public will also be able to access the video episodes through the K Channel.